Chennai is already home to a lot of multiplexes and now there is another one added to the list. INOX Leisure, an organisation based in Mumbai, has launched a new multiplex theatre along the Old Mahabalipuram Road (OMR) at the Marina Mall. With theatres at Chandra Mall in Virugambakkam and Citi Center in Mylapore, this will be their 3rd multiplex in Chennai. The theatre has 8 screens and it's amenities include paper-less check-ins, touch-screen enabled ticketing and interactive food-ordering. It also has a restaurant and a separate play area for kids. The multiplex has 1820 seats spread across eight auditoriums. The occasion also marks the launch of INOX’s homegrown giant screen format – BigPix in India. 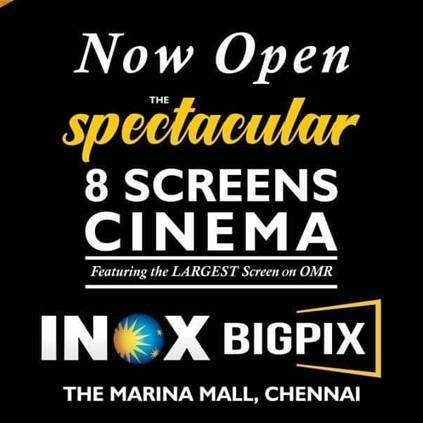 This increases the count of INOX screen in Tamil Nadu to a total of 31 screens across five properties. The screens are equipped with Laser projection system that offers 300% brighter and crystal clear image. It also has a Dolby Atmos surround system and a 3D projector that is powered by Volfoni Smart Crystal Diamond solution. People looking for online information on Inox, INOX OMR will find this news story useful.